SAY NO To any DANGEROUS HAIR GROW CHEMICALS like STEROIDS, ZINC etc. 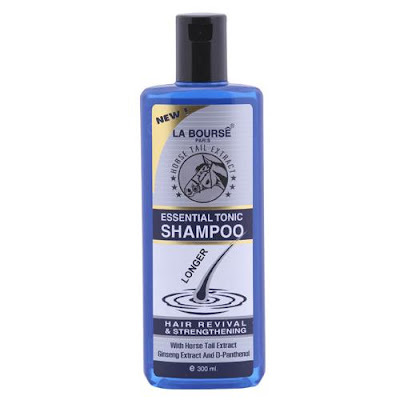 La Bourse Essential Tonic Shampoo is made out of natureal Ginseng, D-Panthenol and Vitamins incl. the very effective Witchazel and Horse Tail Extract. The Shampoo helps to enlarge the capillary blood vessels and activate the hair papillae to stimulate hair growth. Stimulates cells act as protection against hair loss and strengthen the hair. THe Shampoo detoxifies the scalp and eleminates dandruff and scalp itching. 1st Step: Apply shampoo on wet hair evenly and massage it for 5 minutes.